On Monday, the day before the Olympic hockey tournament begins, the so-called “time off” for the Blackhawks is already getting interesting. 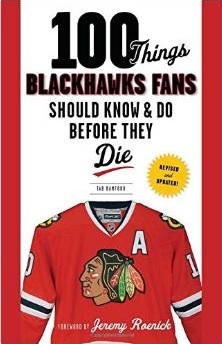 ESPN 1000’s “Afternoon Saloon” reported that a source inside the Blackhawks told one of the hosts, Harry Teinowitz, before Saturday night’s game that Antti Niemi would start both weekend games “no matter how he performed on Saturday.” The reason, according to the source, was because the Blackhawks were close to trading Cristobal Huet. Teinowitz claimed that his source said the Hawks were talking about a deal that involved both Huet and minor league netminder Corey Crawford. He also claimed that the Hawks were shopping for a power forward, and the St. Louis’ Keith Tkachuk was mentioned as an example of the type of player the Hawks were looking for on the market. First and foremost, the thought of the Blackhawks making any deal that involves both Huet and Crawford seems unlikely on face value. Unless a goalie came back in the deal, moving Huet and Crawford would compromise the organization’s depth too much to make sense. If Huet is not back in Chicago next year, Crawford would figure to somehow be involved in the equation because he would cost very little to retain. There have been a number netminders rumored to be available. Boston’s Tim Thomas had been linked to the Blackhawks, as has Dallas’ Marty Turco. When Dallas acquired Kari Lehtonen from Atlanta, coincidentally in the middle of the Blackhawks-Stars game, speculation ran wild that Turco’s days in Dallas were over. Nashville’s Pekka Rinne has allegedly been made available, and if Florida continues their fire sale Tomas Vokoun could enter the market as well. What makes the comments of Teinowitz more intriguing is his claim that the Hawks were looking for a power forward. With a roster that currently includes Dustin Byfuglien, Andrew Ladd, Troy Brouwer and Ben Eager, and with prospects like Jake Dowell, Bryan Bickell and Kyle Beach already in the organization, this rumor also appears to be contrary to logic. When the Blackhawks dealt Cam Barker to Minnesota for Kim Johnsson and Nick Leddy, GM Stan Bowman showed the ability to get considerably better value for his assets than many fans, and analysts, considered possible. Whether or not the jokes about Minnesota collecting former Chicagoans have any weight, the performance of the Hawks over the last two years has likely elevated the value of Blackhawks’ players in the eyes of the rest of the league. The Blackhawks might not be done dealing, and this latest rumor raises eyebrows. Considering how much money the Hawks still need to cut off next year’s payroll, it’s understandable that the Hawks will continue to be active in the trade market. The smooth transition of Johnsson into the lineup in the last two games before the break certainly helps calm the fears about the team’s chemistry as well. Over the next two weeks, we’ll certainly hear more rumors. This is the start of two furious weeks of talking between GMs with very few games to keep an eye on, and with all of the talent on display in one arena in Vancouver. If the fans are stir crazy right now, consider how close to loco some GMs will be by March 1. I’d prefer Turco to mentor Niemi through April, but Thomas would do nicely. Stan, how many rabbits can you pull out of that hat of yours? I’ll be intrigued to see if there’s anything behind these rumors. Niemi played well enough to earn the top spot in net… but starting an afternoon game after a late night game with travel in between is rare and unexpected, especially when Saturday night was his second consecutive shootout. We’ll see what the roster looks like on March 4.